Shabbos Parshas Vayikra/ Parshas Zachor at the Kollel. 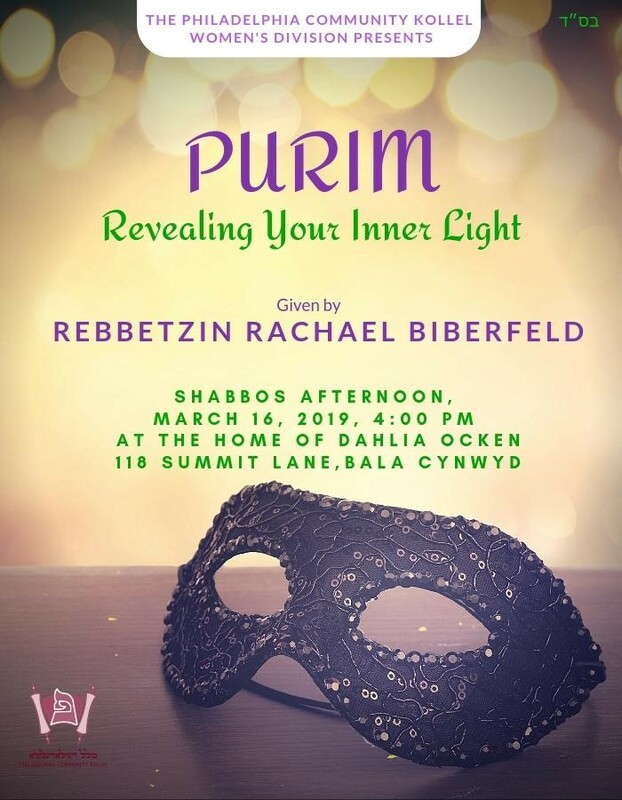 Purim Shiur for Women - THIS Shabbos! Take a part of a Community Siyum! Mr. and Mrs. Aharon and Michal Schapira on the birth of a son. The Shalom Zachor will be help at the Eisenberg home, 345 Kent Road, starting at 9:30 p.m. The bris will take place iy"H at the Kollel on Sunday morning after the 8:00 a.m. Shacharis. Mr. and Mrs. Dovid and Tamar Daniel on the birth of a daughter. 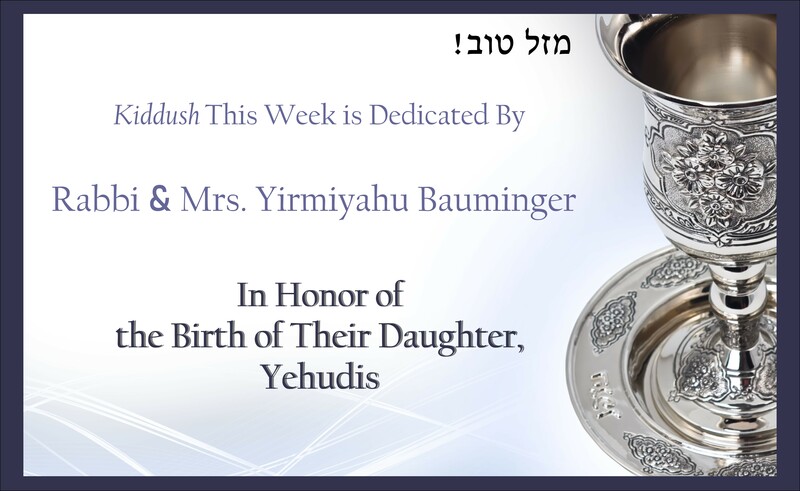 Rabbi and Mrs. Avrum Baum on the birth of a grandson born to their children, Rabbi Moshe Shlomo and Leeba Meth. The Shalom Zachor will be held at the Meth's house, 7704 Langdon Street. The bris will take place iy"H on Sunday morning after the 8:00 a.m. minyan at Congregation Ahavas Torah. The Goldstein family on the passing of Mr. Bennet Goldstein, longtime owner of Goldsteins' Rosenberg's Raphael-Sacks Funeral home in the Philadelphia area. The levaya will take place Sunday, March 17th at 1:00 p.m. at Goldsteins Chapel, 6410 N Broad St, Philadelphia, PA 19126. Click on the logo, to connect to our website. For free Kollel audio shiurim and publications go to the archives tab. Sign Up for the Kollel Credit Card! Save Money and Support the Kollel! To post an event, e-mail support@koshersync.com. The Children's Wonder Words hotline! Join thousands of Children nationwide in an incredibly special tele-experience! CALL IN DAILY AND BE INSPIRED! Click here to register for prizes! Questions or comments about our weekly e-mails? We would love to hear your feedback! Click here to send us your suggestions, praises, criticisms, or any other comment. 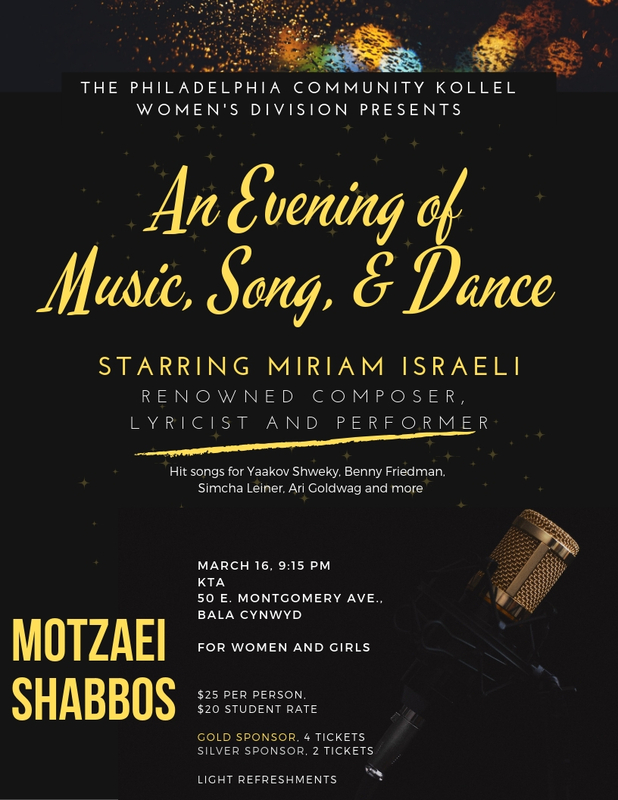 This Motzaei Shabbos, March 16! 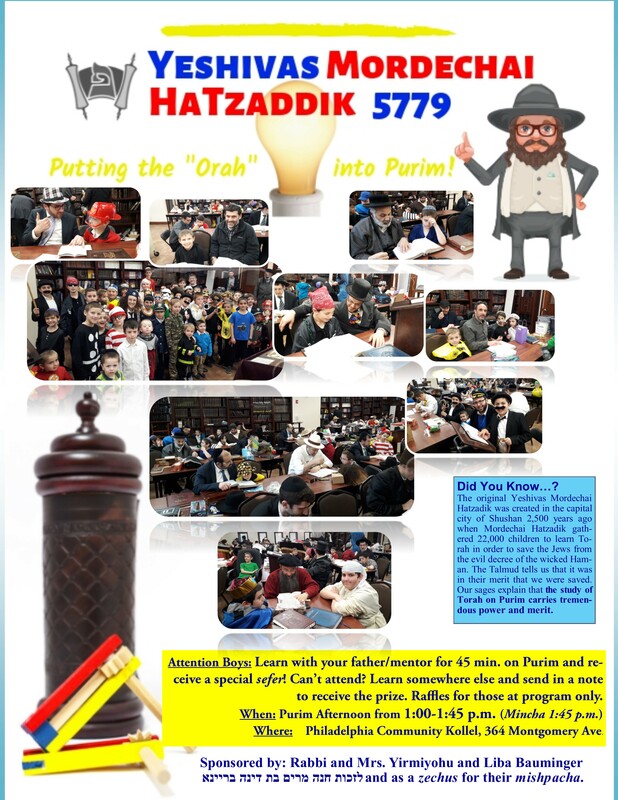 To see information on all our programs and events over Purim, please see our Purim 5779 web page by clicking on this graphic. The Kollel is proud to once again offer the community a Yeshivas Mordechai HaTzaddik program. All boys who attend the program and learn with their father/mentor for a total of 45 minutes on Purim will receive a special Sefer. divrei Torah beginning at 7:00 pm. 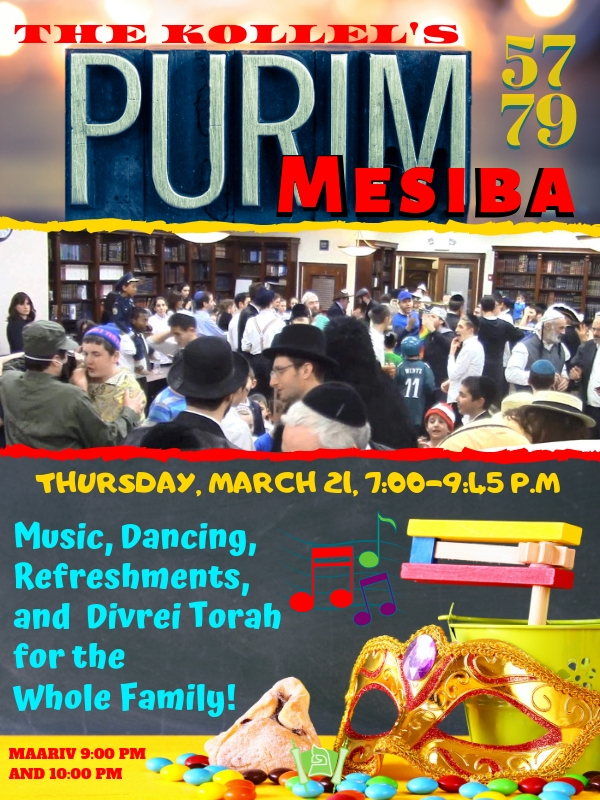 Maariv 9:00 and 10:00 p.m.
after Krias Megillah, Wednesday evening, March 20th. $18 a Daf $180 a Perek $1800 the Mesechta! Please daven on behalf of our dear chaver, Rabbi Mike Stern, Yosef Elimelech Ben Yehudis, sheyichyeh, for a refua shelaima. To make a donation, please click here. Unclaimed items left in the Kollel for longer than 30 days will be disposed of. We have launched a Lost and Found Page to help people become aware of lost items. Periodically, we will post on this page photos of items that are found in the Kollel facility or at Kollel events. Please look at the items and let us know if any of them are yours at office@phillykollel.org. (Please hover over each picture to read further details about the item/s in question. In addition to this page, there is a Lost and Found box by the coat rack at the back door. Bnos will be meeting this week from 3:30 pm - 4:30 pm at LMS. Pirchei/Torah Youth will be meeting this week from 3:30 pm - 4:30 pm. *New!! * Local Shatnez Tester conveniently located on Stoneway Ln in Merion Station! Dropoff hours Sunday and Thursday 1-2pm and 7-8pm. Endorsed by local Rabbonim. For more info call: (718)570-2729 or email yyakerman@gmail.com. Bauminger's Library: The library will once again be open every Wednesday from 7:30 p.m. - 9:00 p.m., at 228 Stoneway Lane, Merion. "כל השונה הלכות בכל יום": "Whoever studies two Halachos a day is assured a place in Olam Habah." If you would like to receive a free daily e-mail with two halachos a day, go to www.halachafortoday.com and sign up, or send a request to dailyhalacha@aol.com. These are two separate services with separate halachos. Rabbi Ungar's dynamic shiur on the Parsha- please join us for an unforgettable shiur every Monday night at Jeff and Daryl Klein's home at 161 Union Avenue at 8:15 p.m.